With mothers day coming I have given some thought to the gifts that I received through the years. My favorite were the ones that the kids made, or purchased on there own. I have some of them still on display in the china closet. The earrings my son bought me from Cheap Johns, he told me they were diamonds! WOW, who knew I would cherish them and some of the other gifts my children got me over the years more then the diamonds I have. (Believe me the diamonds around this house are rare.) The best "diamonds" were always the ones the kids picked out from Cheap Johns or the school store. 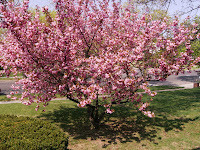 I also loved the plants I received, one of my favorites is the kwanzan cherry tree, it was just a branch when I got it. She loves you just as much, as she held you that first day." 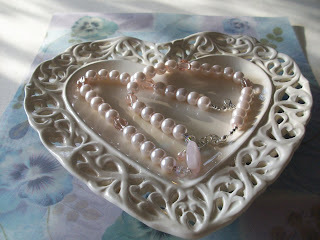 A special mention: http://www.carpetbaggercreations.blogspot.com wrote about me on her Handmade blog, it is exciting and wonderful to be placed along with such talented people whose stories she shared. You touched my heart. My babies are 25 and almost 21 - they will ALWAYS be my babies. Funny I can recall the things they did as if it were last week but don't know where I put the car keys 5 minutes ago. Hi ~ Thanks for visiting my blog. What a sweet post. I still have some cherished long-ago gifts from my now-grown sons.